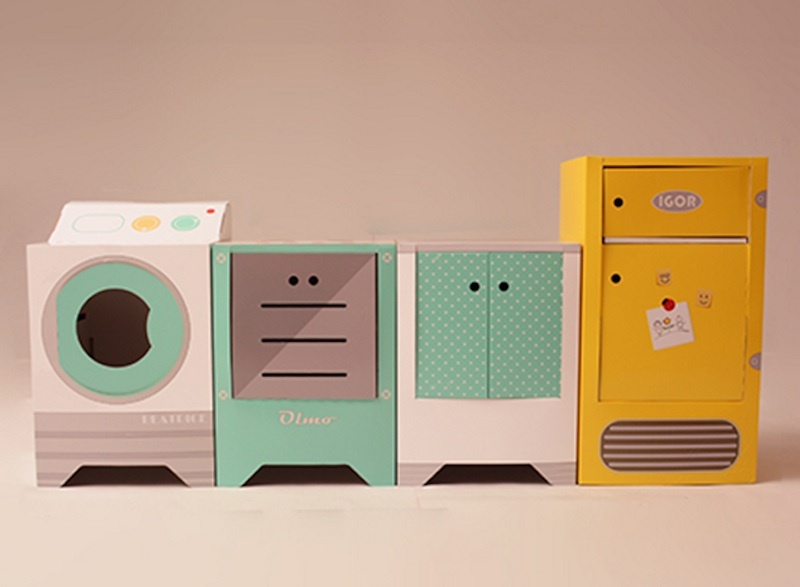 Most parents will agree that cardboard is probably the most useful and eco-friendly material in the entire world for creating forts, making houses, standing in as boats, and making props, but the cardboard appliances and house from Italian company Eco and You take kid-sized cardboard creations to the next level. With a bright, retro aesthetic and a solid design, these toys are functional and can stand up to the little rough and tumble adventures that come with "playing house." Plus, they have their own names! 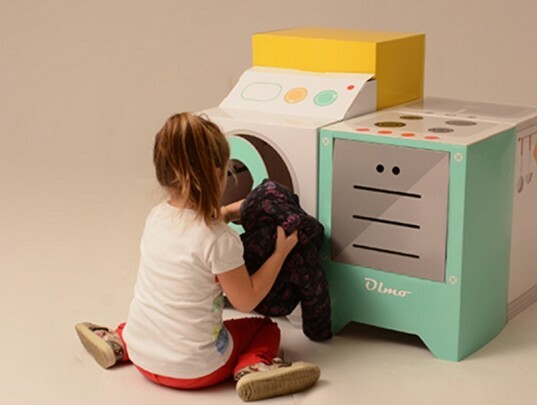 Whether you choose Beatrice the washing machine, Igor the refrigerator, Martino the sink, Olmo the stove/oven combo, or Aglaia the house, or the entire collection, your kiddos can look forward to hours of pretend play, from whipping up concoctions to the inevitable task of laundry (which kids are actually fascinated by). We love the details that Eco and You incorporated into their designs from functioning doors to six different color possibilities for Aglaia’s roof and windows to the tromp l’oeil knobs, utensils, and burners that pop out despite only being two dimensional. We also can’t get over the fact that they can be assembled without screwdrivers, bolts, or tools in just 5 minutes (10 minutes for the house). Eco and You suggests that once kids have (sniff!) outgrown their play kitchen days, you can simply remove the decorated outer covering and the appliances become practical storage units. Of course, you can also simply recycle them. Whether you choose Beatrice the washing machine, Igor the refrigerator, Martino the sink, Olmo the stove/oven combo, or Aglaia the house, or the entire collection, your kiddos can look forward to hours of play pretend, from whipping up concoctions to the inevitable task of laundry (which kids are actually fascinated by). We love the details that Eco and You incorporated into their designs from functioning doors to six different color possibilities for Aglaia's roof and windows to the tromp l'oeil knobs, utensils, and burners that pop out despite only being two dimensional. We also can't get over the fact that they can be assembled without screwdrivers, bolts, or tools in just 5 minutes (10 minutes for the house). Eco and You suggests that once kids have (sniff!) outgrown their play kitchen days, you can simply remove the decorated outer covering and the appliances become practical storage units. Of course, you can also simply recycle them.